Have you gone through the hard work of setting up an exciting new agency, only to run into the challenge how to actually generate SEO leads? You’re not alone. The SEO industry is competitive, and this is true across the globe. It doesn’t matter whether you’re based in the US, Canada, or even Shanghai; chances are that you have tens of thousands of other SEO agencies competing with you, and fighting for a slice of the pie. The good news? There are certain tried-and-tested strategies that you can use to generate more SEO leads for your company, and these strategies are actually pretty straightforward once you get the hang of them. By the time you get to the end of our guide, you’ll be an expert on generating and closing SEO leads. Promise! Conducting outreach on LinkedIn, Facebook, business directories. Attending SEO, web design or general business meetups. Finding poorly designed / badly created websites online, and reaching out to them. Buying leads or emails if necessary. We’ll walk you through each tactic in detail, and discuss the specific steps that you can take to uncover potential clients for your agency. First, one great way of generating SEO leads is to join LinkedIn groups and Facebook groups that are relevant to website performance, business growth and SEO. Make sure you participate actively in these groups, and share your expertise. While you’re doing this, keep in mind that most groups do not allow members to outrightly plug their businesses (eg: “If you need to improve your website’s SEO, please get in touch with me”). However, what you can do is to mention your experience handling SEO projects when you’re interacting with other members, and talk about the results that you (or your colleagues) have helped your previous clients achieve. In time to come, you might get members messaging you and asking you for your help or opinion, and that’s when you can upsell them, and convert them into a paying customer. Next, attending relevant meetups is also a tried-and-tested technique that many agencies fall back on. Get to chatting to the folks at these events, and see if they’re in need of any SEO services. Now, be sure to tailor your pitch to each person you meet here. If a particular lead is working with a tight deadline, and wants to confirm their SEO vendor ASAP, then there’s no harm in telling them more about your agency. But if you’re speaking to someone who’s still learning about how SEO works, then pitching to them right off the bat is likely to turn them off. So, what’s the best way to reach out to leads who aren’t ready to buy? Simple — offer to send them an eBook or other lead magnet about SEO, so that you can get their email address. From there, it’s a matter of staying in touch and adding value to your lead, so that you’re the first person that they think of when they’re ready to buy. Say that most of the clients you serve are in the healthcare industry, and you’re looking to generate more leads who are healthcare companies. Here, you can simply do a Google search, and navigate to the 10th page or so. Now, take a look at all the websites listed on this page; you’ll probably find that most of them are either poorly designed or poorly optimized, which means that they could benefit from your agency’s services. Purchase selectively (ie: only buy leads that are a good fit for you, instead of buying 1,000 email addresses and spamming them with cold emails). First and foremost, make sure you’re buying your leads from a reputable vendor that guarantees a certain level of accuracy. For instance, LeadCandy guarantees that no more than 5% of the verified emails they charge their customers for will bounce, and should a customer’s bounce rate exceed 5%, they’ll gladly refund the credits charged for those emails. Another tool we like is UpLead, which verifies its leads’ email addresses on the spot, before releasing the information to its customers. This makes it easy for you to build highly-targeted lists, and reach out to leads who are a good fit with your company. On top of utilizing the techniques we’ve just discussed, we also recommend that you invest time and energy into inbound marketing (ie: creating content to attract leads). While some of the above strategies can limit out, or are unsustainable in the long run, inbound marketing is one of those things that can continuously drive results for you. The simplest way of getting started with content marketing is to start blogging on a regular basis. Once you’ve established your blog, add a Call To Action (CTA) to your blog articles to get readers to join your email newsletter. Once you get your readers’ email addresses, you can start nurturing them, and hopefully sell to them further down the road. Blogging can be exceptionally effective in driving leads — but that’s assuming that you put in the time and energy into producing high quality, valuable content. Remember: it’s all about the context. The solution is obvious: quit writing 500-word articles that are generic, fluffy, and don’t add value to your readers in any way, and start producing more Ultimate Guide type articles that are rigorous and substantial. Now, other than adding your standard CTA to your Ultimate Guide articles, here’s another genius way that you can use these articles to generate leads: offer a free PDF download of the article, and capture your readers’ email addresses in the process. At the start of the blog article, UpLead embeds a form that allows readers to input their email addresses in order to receive a free PDF of their Growth Handbook. It isn’t easy to get through 230+ tips or tactics in a single sitting, so we’re betting that they drove a ton of sign-ups (and leads) using this form! Like we’ve just discussed, we know it’s important to produce high quality, valuable content. But this doesn’t mean that you can focus on quality at the expense of quantity — both these things have to go hand in hand. In other words: if you don’t post regularly and consistently, it’ll be tough for you to generate a significant number of leads from your blog (and that’s even if you produce some of the most amazing content that the world has ever seen). So, how often should you be blogging? The answer is… as much as possible. 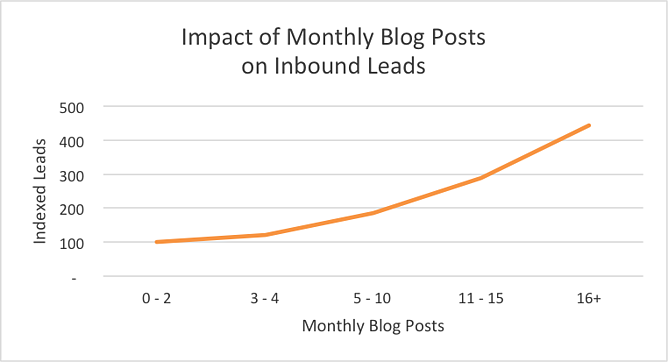 According to HubSpot, companies that publish 16+ blog posts per month get 4.5x more leads than those that publish 0 to 4 monthly posts. As you improve upon your blogging and content marketing, you’ll have a long list of leads (and potential SEO clients!) whom you can reach out to. But before you reach out to them, you’ll want to take some time to research your leads and their companies. Look at their website to see if it’s updated. Are there any design or UX problems with the site? Are there any SEO problems? Is the site mobile-friendly? Look at their off-page SEO such as keyword rankings and backlinks, and benchmark them against their competitors to see if there’s room for improvement. Look at their social channels and assess their social strategy. Are they posting regularly? Is their tone consistent? Do they have a decent following and engagement level? Are they replying to the comments that they get on their posts? The goal is to have a solid understanding of your lead’s situation (and the current challenges that they’re facing), so that you’re well-equipped to provide them with valuable insights when you speak to them. Once you’re done researching your lead and their company, the next step is to reach out to them. In this section, we’ll walk you through the best practices for emailing and getting in touch with your leads. Most marketers and sales reps employ formal language when writing sales emails — so an easy way of standing out is to keep your tone casual. As a general rule of thumb, the more your subject line sounds like it was written spontaneously and by an actual human, the higher your open rate will be. Say you’re hoping to land a face-to-face meeting with your lead. When you’re asking for this meeting, it’s important to frame your request in a way that makes things easy for your lead. Here’s a negative example: I’d love to set up a meeting so that I can explain our SEO services to you in detail. Could you propose a couple of dates and timings in which you’re available, and let me know what location works best for you? And a positive example: I’d love to explain our SEO services to you in person. Shall we meet at your office some time this week? You can choose a date/time that suits you best using this link. See the difference? The easier it is for your SEO clients to follow through, the higher your chances of converting your clients. According to statistics, if you want to get a reply with your email, you should aim to have your email be between 50 to 125 words. Remember: you’re not actually selling to your lead in your very first email to them — so you don’t need to ramble on and on about the advantages of working with your agency. You’re just trying to hook them and get them intrigued, so keep it short and sweet. Marketers and sales reps dislike doing follow-ups for a number of reasons. Some folks find it difficult to remember to follow up. Others might be afraid of coming across as too pushy or aggressive, and yet others might (mistakenly) believe that follow-ups aren’t effective. Well, here’s the thing: follow-up emails can actually get better response rates than your first email. According to this study, first emails get an 18% response rate on average, fourth emails get a 13% response rate, and sixth emails get an impressive 27% response rate. So, does that mean all sales reps should devote 2 hours per day to sending follow-ups to their SEO clients? Nope, that’s not necessary. It’s fairly simple to automate your follow up emails, even if you don’t have access to a fancy marketing automation platform or system. 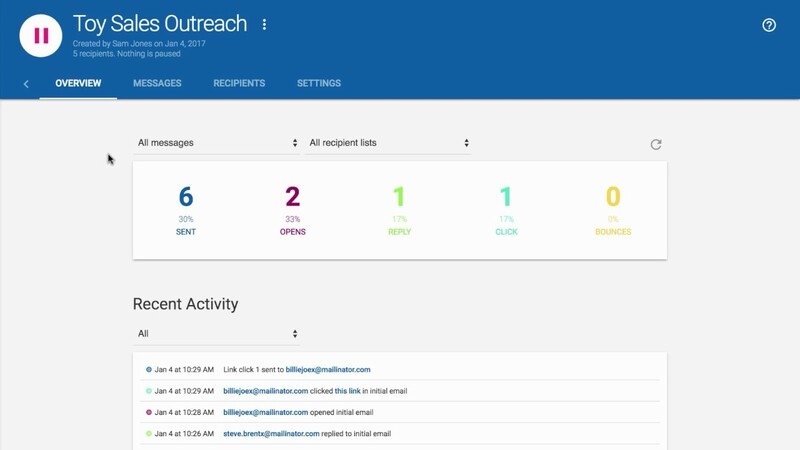 To do this, simply use Mailshake, Quickmail, or a similar tool that plugs directly into Gmail. That’s basically it! If your leads don’t respond to your first email, the tool will trigger your follow-up emails automatically. Once your lead responds to a follow-up, the emails will stop, and you can take it from there. We’ve covered quite a lot of material on how to generate and reach out to your leads, but let’s backtrack for a second to discuss the importance of reaching out to the right leads. Basically, this is all about working smart. If you make the effort to identify and sift out high quality leads right off the bat, this means that you’ll waste less time talking to people who won’t convert further down the road. To go one step further in assessing whether a potential client is a good fit, use tools such as Spyfu to identify if their company is spending on PPC. If they are, this is a good indication the company has a sizeable marketing budget, and that they understand the importance of marketing. We’ve covered the Do’s; now, here are the Don’ts. Make sure you steer clear of these mistakes when you’re pitching your agency’s services! We all know that there are a ton of factors that influence a company’s SEO ranking (and that these factors are constantly changing). This makes it pretty much impossible for an SEO agency to guarantee rankings — regardless of how capable they are. Bearing this in mind, don’t rashly promise your lead that they’ll rank within a certain period of time, even if you’re confident that your company can achieve this for them. You don’t want to overpromise, and land your company or colleagues in hot soup! When’s the best time to reach out to your lead? Well, given that most leads do business with the company that contacts them first, the answer is: as soon as they enter your system. The above infographic says it all — if you want to have the best chances of doing business with your lead, then be sure to contact them within 5 minutes of hearing from them. It’s important to be courteous and polite to your leads, but you don’t want to go to the extreme, and bend over backwards to please them. Why do we say so? Well, if you pander too much when communicating with your leads, they might take this to mean that you’re not confident in your agency’s services, or that you’re desperate for their business. Obviously, that’s a huge turn-off. Alright, that’s all we’ve got for you on the topic of generating and closing leads! Before we wrap up, we’re throwing in one awesome hack that you can use to quickly generate more leads for your agency. To do this, simply offer a free SEO Audit on your website. How does the tool work? Well, once you embed the tool on your website, you can start offering free SEO audits to your website visitors (and use these audits to capture leads). When someone requests for an audit, the tool will generate a custom report (branded with your logo and colors) for them, and capture their contact information at the same time. Just to be clear, this is one of those set it and forget it type things. The tool will run on autopilot in the background (without any involvement from you! ), and you’ll get new leads delivered straight to your inbox, everyday. Click here to get your White Label SEO Audit Tool, and start upping your lead generation game today! SEOptimer's CEO and venerable leader. Adam has a wealth of experience across Digital Marketing, SEO and software, and enjoys sharing his learnings from growing SEOptimer to an audience of over 100,000 monthly users. 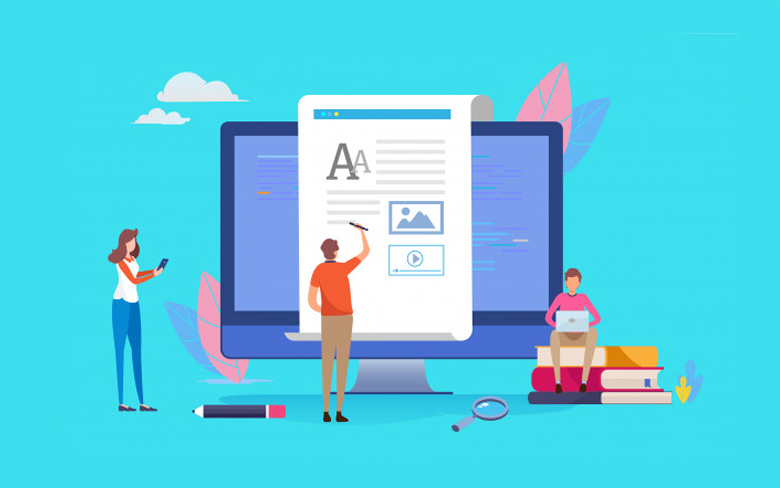 Webpage Size – Why is it important? And how do you optimize it? Why Have Social Media Links On Your Website? SEOptimer - SEO Audit & Reporting Tool. Improve Your Website. Win More Customers.